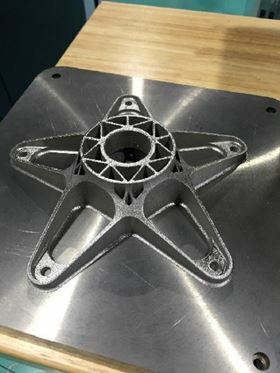 A 3D printed wheel center. Renishaw has supplied metal additive manufacturing (AM) technology to help develop lightweight titanium wheels. This has reportedly helped an electric car developed by students from Swinburne University of Technology in Melbourne, Australia, to reach the university's highest overall score in the latest Formula SAE competition. As well as being placed sixth overall, the highest position for a team from the university, the vehicle recorded some of the fastest times in the speed trial part of the competition. The team focused on ways to reduce weight, particular in the wheels. As a result, the aluminium wheel centers were replaced smaller ones made from titanium alloy by additive manufacturing. The new design also used a carbon fiber band in place of the aluminum one to give the maximum weight savings of 20%, resulting in a significant 75% reduction in rotational inertia. Formula SAE is a competition organised by the Australian branch of the Society of Automotive Engineers in which teams of students produce a prototype for a single-seat racing car. GKN plans to offer design, manufacturing and consultancy services to the Panasonic Jaguar Racing Formula E team over the next few years.